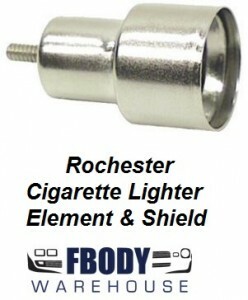 For use on 68 69 Camaro This is a new cigarette lighter element for Rochester lighters. if your cigarette lighter is not working but you have power to the housing this may be the reason. This simply screws onto your lighter knob and is a replacement cigarette lighter element. Install takes seconds and this will help get your Camaro back to like new condition! For use on 1968 - 1969 Camaro although fits many GM cars and trucks. Guaranteed correct reproduction to ensure your Rochester type lighter assembly will function safely as original. Heating element, shield and ceramic insulator.